The McGill University Health Centre (MUHC) inaugurated today its Glen site with a celebration and ribbon-cutting ceremony that capped decades of dreams, plans, construction and successful moves to a physical plant built for 21st-century academic medicine. In addition to MUHC leaders, speakers at the historic event included His Excellency the Right Honourable David Johnston, Governor General of Canada; Quebec Minister of Health and Social Services, Gaétan Barrette; Montreal Mayor Denis Coderre; and McGill Principal and Vice-Chancellor, Suzanne Fortier. Thousands of Montrealers from all walks of life also joined in the celebrations, including the Walk for Montreal! and evenko concert. Many individuals, from managers and physicians to healthcare professionals, volunteers and patients, were involved in the design, planning and project’s management, including the Office of the Executive Director of the Modernization of Montreal’s Academic Health Centres, Clermont Gignac and his team. SNC-Lavalin and its partners, under the leadership of CEO Robert Card, and Pomerleau-Verreault carried out the construction. The Glen site was funded in part thanks to generous donors through the $300-million The Best Care for Life and The Best Care for Children campaigns. John A. Rae and Marc Courtois, chairs of these campaigns launched publicly in 2005, expressed their sincere gratitude to foundations, community leaders and citizens for supporting this once-in-a-generation redevelopment project. They also recognized the invaluable contributions of co-chairs and honorary chairs who led the Community and Public phases, notably: Drs. Sylvia and Richard Cruess; France Denis (Royer) and Raymond Royer; Helgi and Ian Soutar; Mutsumi Takahashi and the late Jean Béliveau; Claudio Bussandri, the Honourable David Angus, Arnold Steinberg, David Culver and Alex Paterson. In addition, the Executive Committee was acknowledged. Members are Peter Abraham, Mark Beaudet, Joan Ivory, John D. Morgan, Gwen Nacos & Family, Norman Steinberg, Pierrette Wong, Claude Dauphin, Peter Duffield, David Laidley, Steve Merling, Cheryl Campbell Steer, Peter Coughlin, Richard Pattee, William Eakin, Jacques Filion, John Peacock and Bruce Shadeed. Mayor Denis Coderre served as Grand Marshall for the 3-km Walk for Montrea!l from Dawson College to the Glen site, which kicked off celebration. 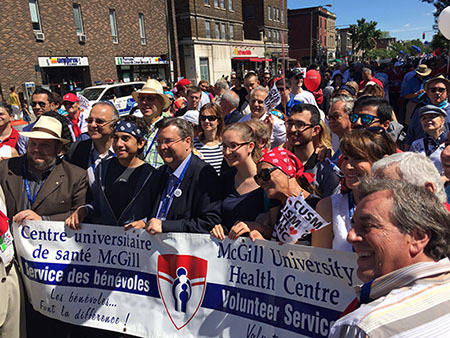 The MUHC Cardiology’s “Heart and Sole”, Westmount-Ville Marie MP and former astronaut Marc Garneau’s Team and McGill, Dawson and John Abbott Nursing were just some of the 250+ groups that rallied together from all over Montreal. Once at the site, they were treated to an evenko concert, pre and post the inauguration and ribbon-cutting ceremony: Star Académie winning singer-songwriter Stéphanie Lapointe and Canadian Juno award-winning singer-songwriter Sam Roberts Band. Celebrations continue on Sunday, June 21, with a free Community Festival featuring activities for all ages, including inflatable games, face painting and a meet-and-greet with Canadiens’ alumni Chris Nilan, Guy Carbonneau and Mathieu Darche, as well as more great evenko performances featuring talented Montrealers, including Nikki Yanofsky, the Montréal Jubilation Gospel Choir, Oliver Jones and others! The MUHC is very grateful to its sponsors for covering all the costs of these memorable celebrations. Their generosity helped bring Montrealers together to mark a major chapter in the history of the McGill University Health Centre, whose founding hospitals have been proud members of the city for over a century.